A full course meal in a restaurant is an excellent way to mark an occasion, which is why we have a special menu for communions and confirmations. As an Italian restaurant, this makes sense: Ireland and Italy share a lot of things and religion is one of them. The old tradition of visiting the homes of relatives and friends and being gifted with money has all but died out. It has been replaced by a visit to a restaurant. Communions and confirmations are essentially coming of age celebrations. They mark the reaching of a degree of maturity. What better way to complete the occasion than by going for a meal in a restaurant – an activity that demands certain standards of behaviour and etiquette? But going for a meal is also a way to relax and unwind for all members of the family after all the rituals and formalities of the day. 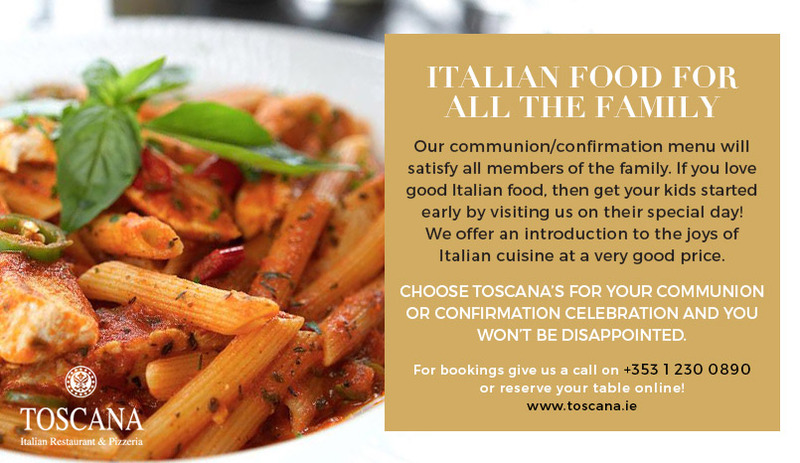 At Toscana’s we have tasteful and classy surroundings, a sophisticated ambience which suits the importance of the occasion, but we also put a lot of love into our food and warmth into our service. 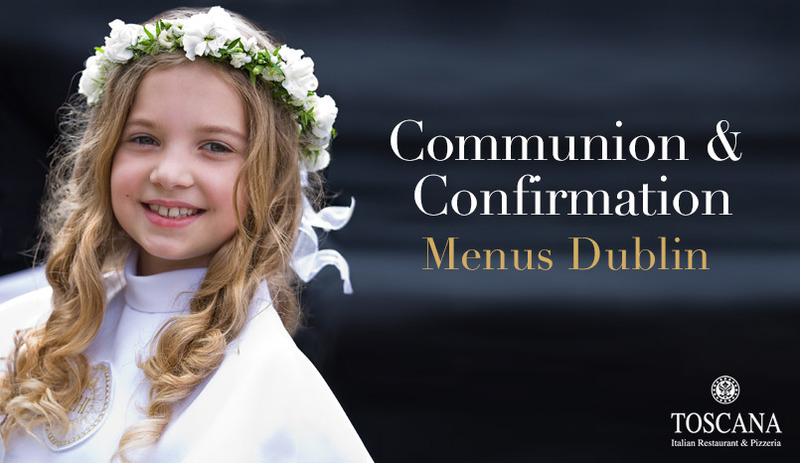 We have created a special menu for communions and confirmations because we appreciate their special status. It only happens once in your life, so it should be a memorable day. A delicious meal in our top-class restaurant will help to make it so. For starters how about some classic minestrone soup? Or garlic mushrooms, sautéed with lots of garlic, fresh cream and Italian herbs? Or maybe our delicious bruschetta, a toasted homemade bread topped with chopped fresh tomatoes, fresh basil and extra virgin olive oil? For mains how about our exquisite salmone al forno, a fillet of Irish salmon, oven baked and served with lemon and dill cream sauce? Want something more traditional? Try our spaghetti Bolognese or lasagne, both cooked with traditional Italian recipes. Our delightful tagliatelle alla Toscana consists of slices of chicken fillet in fresh cream, cooked with garlic, fresh coriander, white wine and parmesan cheese. Or how about our penne marinara fresh calamari, made of prawns, tuna and mussels cooked in garlic and Pomodoro sauce? Our communion/confirmation menu will satisfy all members of the family. If you love good Italian food, then get your kids started early by visiting us on their special day! We offer an introduction to the joys of Italian cuisine at a very good price. 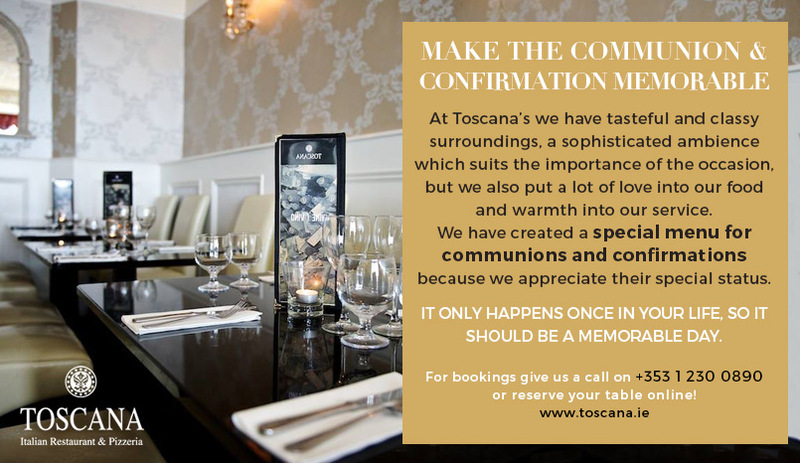 Choose Toscana’s for your communion or confirmation celebration and you won’t be disappointed. For bookings give us a call on +353 1 2300 890 or reserve your table online!